Brown fields (land contaminated by past industrial use), crowded buses, six corner stores in a seven block radius—none of which had fresh fruits or vegetables. Asthma, low-wages and affordable housing were among the many issues that East Oakland residents highlighted for Oakland’s mayoral candidates. Roughly 70 – 80 people attended the East Oakland Mayoral Candidates forum put on by local residents and Building Healthy Communities at the Allen Temples Arm Retirement Community. The room was filled with senior citizens, youth, parents and the working people of Oakland, patiently waiting to hear mayoral candidates propose viable policies and solutions that have incessantly plagued the East Oakland community. The forum, designed and run by residents, is part of the Building Healthy Communities initiative. Candidates had the opportunity to speak on the following issues: housing & displacement, healthy food, transportation, and economic development & safety. Each candidate was given two minutes to speak on two of the four issues. Rather than hear candidate ideas and opinions, residents were more interested in candidates offering concrete, viable policies and plans that would holistically address the increasingly debilitating community health conditions of East Oakland, conditions that have many residents underscoring that East Oakland is the “forgotten part” of Oakland. Each issue was framed by a personal story. Facts gleaned from a survey among Oakland Residents were presented, followed by two questions that called for specific policies and solutions. One resident, senior citizen Karen Sullivan, told her story. She lived in her cottage behind her landlord for 13 years. After her landlord passed away she had six landlords; all of them tried to evict her in an attempt to garner more profit from her home. Fortunately, measure EE, the “Just Cause” eviction ordinance protected her from unjust evictions. But she still had to deal with actively unresponsive landlords refusing to repair her leaking roof. After asking for it to be fixed many times with no response, she had to file a complaint with the city. The leak was finally fixed, but by then the mold settled in her ceiling prompting her to have terrible asthma and pneumonia every year. Other residents highlighted the dearth of healthy food options. “We all know how far we have to go to get healthy food”, said mayoral candidate Nancy Sidobotham. “They took out the Foodmaxx. Now, we all make that long trek to San Leandro to buy fresh food. We have to ask why we continue to be the forgotten part of this city.” Many people in the crowd nodded and clapped. 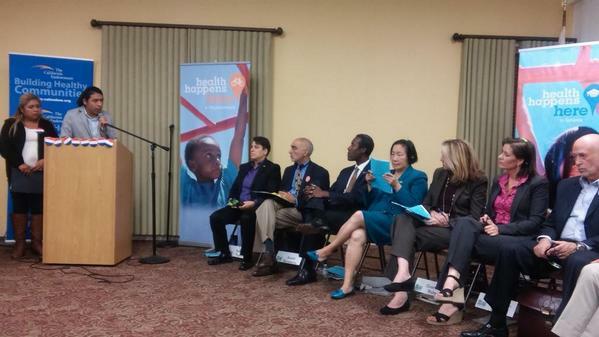 “How can I as a father expect my son to make healthy choices, if our children aren’t given any,” a resident said. Mayoral candidates and residents agreed that while there is a plethora of unused public land – enough to grow healthy and fresh food for all residents – much of the unused land and vacant homes sit on brown fields. Additionally, to grow a significant amount of food, residents must pay for a $2500 permit. This makes locally grown food much more inaccessible. While food deserts and air pollution run rampant, Oakland does not run short in low-wage jobs, jobs that further exacerbate the debilitating conditions of living in East Oakland. “Many people are spending over half of their income on rent. We have to decide on how to pay our rent, and deciding how to meet our needs affects our health”, another resident said. Rent has increased 10 percent last year, while the minimum wage remains $7.75. The majority of jobs added to the community were low-wage jobs, like Walmart and Fast food restaurants; jobs that offer no health coverage. Mayor Jean Quan noted that to live in Oakland, one had to make between $24 to $28 dollars an hour but offered no viable solutions to solve the complex challenges of East Oakland other than providing a percentage of “affordable housing”. At the end of the forum, a couple of residents stayed behind to chat with candidates. Others slowly readied themselves to exit while commenting on how they thought candidates did. “They didn’t really offer any real solutions to the problems,” said Marina Munoz, an East Oakland resident and leader from Building Healthy Communities and the Parent Leadership Action Network said. “But it felt good to share my personal story.” Other residents like Maxine Oliver Benson agreed. Other residents thought the statements of the candidates were good. “I think they all had good statements. Some of them were unrealistic. They didn’t talk much about the actual things they were going to do for us, other than playing up their track records and what they’ve done for others”, Will Walker said. 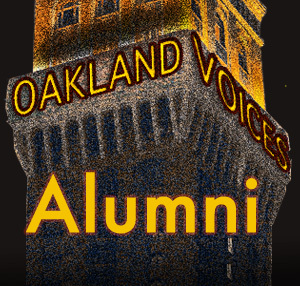 Walker has lived through the rapid change of East Oakland in the last four years on 46th said. In the end, residents reiterated that all of these issues are connected. What residents want is an Oakland Community where all Oaklanders can thrive, and can fulfill their hopes and dreams, regardless of age, income, and education. Work For All – A regional summit that brought East Bay residents and organizations together for deep discussion on creating an inclusive economy for groups such as youth, the formerly incarcerated and immigrants. Love the way you wrote about this event. You captured it all!